Please welcome Storyheart, author of Across the Pond. One lucky commentor will win a copy of the book as well as some wonderful English goodies! You have until March 6th to enter. Good luck! You write under the name Storyheart-where did you come up with that pen name? It’s quite a long story. I have been chatting online for around 15 years, going back to the days of the old html chat rooms before you had pretty faces and everything was either in html code or abbreviated letter lol, rofl, *L* etc..
From then on I used that name to write me romance stories, stories that came from the heart, the name of my first book was actually called “Stories from the heart” The book was actually terrible full of mistakes the company that was meant to do the editing actually used the wrong version of the final draft when they published it. Still it was a learning curve. I have basically re-written all those stories plus created plenty of knew ones since that time, so perhaps one day I’ll re-produce that book. One final snippet… When my wife and I first met we were both still technically married going through divorces, and of course we were also 3000 miles a part from each other. I wanted to purchase her something special for our first Christmas as “an item” so purchased our first domain where the stories and everything else first came into fruition. The domain I gave her for that first Christmas is still one we use. It is “4tenderheart.com” purchased for my wife Tenderheart on our first Christmas. -You met your wife while you were in England and she was in America. What was the hardest part of traveling "Across the Pond" for you? Not counting the phones bills and the differences in time zones the hardest part was we were both starting to go through our own divorces at the time. Then it was a case of getting over to the US and getting a Visa. I was lucky and after much heart ache and searching I managed to get a job through my own company. It was not a transfer so I could not bring much over. I started in the US with three cases, and t cardboard boxes if my life and that was it. Everything else, every part of my history, my life, family, friends and everything had ever known was left in England. I took a lot to leave everything you have even known to move to a new country to be with a woman whom you have hardly met. Where did you come up with the idea for Across the Pond? Were there any inspirations that helped the story form? They say write about what you know, and obviously I know all about the issues in moving across the pond to the US. People state, that I have not lost my English accent (As you can hear on my radio interviews http://www.across-t-pond.com/review2.html)I tell them I refuse to, I will always be English. Words sayings still happen at work meetings that I have to explain to people. It adds to the humor of work.One thing people ask and don’t realize, how much it takes now to get a green card, I can’t get one any more just as I am married to an American with two American children.The duel Visa which I could get, is not really what you think, I would still have to give up my allegiance to the Queen, something I would never do, SO green card it is. So writing about what I know is what led me to Across the Pond. I wanted a romance book with humor as well as something that adults would enjoy. I have started the next book, it is called “Across the Pond and Back Again” and carries on from where Across the Pond finishes. I have taken note of many comments and helpful advice that has been offered re ways I can improve and will try and add a new person or two who have a little more of a jagged edge to their character as well as bringing some of the old characters back into the new book. Some of the readers have also been generous enough to allow me to use them as a sounding board (and of course they will get credits) so I will not lose the rhythm and voice in this new book. Listen and learn. There are so many other writers and groups on the internet that are only too willing to help you as you some to grips with your book. It does not matter if it’s not a literary mast piece, if it’s not a prize winner but if people like it. Enjoy the read and let you know this is the case then you have done ll you can. Above all no matter what be proud of your book. It is something you have created a unique numbered document with your name on it. The just enjoy the ride that your books takes you along. -If you could live inside any book, which would you choose? Now that is the first time I have been asked that question…hmmm interesting question. I love sea faring books and the Sharpe series but those times for tuff so I’m no so sure about living in one of those. Of course there are ones like “the hundred most beautiful woman of all time” that might have its advantages *grin*. Seriously though, to live in one book would be something. I think it would have to be fun, have to have romance and have to include adventure. Hay sounds like my Across the Pond “lol” well that or a Brad Pitt novel something where the hero gets the woman, and everybody lives happily ever after.
. -If readers were to travel to England, what's the one thing they must do? However to most people a visit to England means London. When there us the underground (Subway) there is a card now called the Oyster that means you can travel anywhere for on payment. Use one of the tourist busses that take you round pointing thing out, you can always visit them later. A lot of people do this but only see part of London. I would also advice going on the river tour. Much the same, but you are seeing things from the river Thames. These two trips will let you see so much of London. If you can also take a trip on the London Eye, it is like a giant Ferris wheel that let’s you see London from the air. England is one of the most beautiful places in the world with so much to see and learn. I’d advise it to anybody (does it sound like I miss it terribly, but I have an family here now so here I will stay). About the Book: Years have passed since the death of Alice's mother, but Alice can't seem to move on. Her father has re-married and his new wife has just had a baby. Alice doesn't want anything to do with them and finds comfort in her music and her boyfriend. When Alice, her step mom and her new baby sister find themselves trapped in a deadly snowstorm, Alice finds herself having to face issues and feelings she's pushed aside in order to save her life. GreenBeanTeenQueen Says: I am a big fan of Lisa Schroeder and she doesn't disappoint! Alice's journey is beautifully written and full of emotion. I loved her boyfriend Blaze, who is such a great example of an awesome boyfriend-I kind of had a book boy crush on him. I also liked the elements of Alice and her faith-it wasn't overt or anything, but it made Alice a more realistic. I did find myself wanting to yell at Alice for being so selfish at times, but that's what makes Lisa Schroeder such a great writer. Her characters are real, their relationships believable, and her writing flows. I still like I Heart You, You Haunt Me better, but if you liked that book or are a fan of novels in verse, give Far From You a try. Also in case you missed Cynthea Liu's Great Call of China release party, the after party is still going strong over on Cynthea's site, with a chance to win "the great haul of China!" I'm loving this online release party trend! Anyone else like author's who have online release parties? Have you attended any before? About the Book: Kyna hates water. Ever since a boating accident left her orphaned, her fear of water has taken over. She is afraid of walking on the beach. There’s no way she could swim. Even the idea of taking a bath is enough to send Kyna into a panic attack. So when Kyna’s adopted parents announce they’ve rented a lake house for the summer in hopes that Kyna will take more water steps, tasks to get her closer to the water, she is less than pleased. How can she stay in a house surrounded by a body of water? She’d much rather spend time taking photos on dry land. Kyna’s summer starts to look a little brighter when she befriends Tylo. Tylo claims to have seen silkies in the lake and wants Kyna to help him find the truth with her camera. Kyna isn’t thrilled about getting close to the water, but she doesn’t want to lose her new friend. Can she finally push herself to the biggest water step of all? GreenBeanTeenQueen Says: As someone who really hates swimming and the thought of going underwater, I could relate to Kyna. When I first picked up this book, I was thinking ok, another book about a girl over something she fears-which wasn't a terrible thing, but not something I thought would really thrill me. 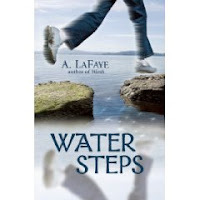 But Water Steps is more than a story about a girl trying to overcome her fear. There are fairy tales woven into Kyna’s story. A. Lafaye writes a beautiful tale of risks and growth and adds Irish folklore into the mix. I loved the added element of the silkies and the tales that Mem and Pep would tell Kyna. This is a great read for readers who like their stories with a hint of magic. About the Book: Fred is a teen boy from England who is faced with the choice of spending time with his grandmother or heading to America while his parents are on vacation. He chooses to travel Across the Pond to stay with friends of his parents and their daughter Brittney. Brit and Fred quickly share an attraction and a romance between the two begins. Brit and her friends have a secret about Steve Harris, a bully from school, and Fred decides to take it upon himself to put Steve in his place and become Brit's "English Knight." GreenBeanTeenQueen Says: Across the Pond reminded me of an old fashioned story. Even though it's marketed as a YA romance, it's really something any age could pick up and enjoy. My favorite part of this was the project that Fred had to work on while in America. Fred was keeping track of all the language differences he came across between American words and British words, which sometimes left him embarrassed. Plus, I learned a lot and wish I could take a trip to England! Some things were a little too perfect about Fred's visit to America, but overall this is a sweet, quick read. There's plenty of humor and mishaps to keep the story moving along. The ending leaves open some opportunity for a sequel, so I'm sure this isn't the last we've seen of "Brit and her Brit." I will be featuring an interview with the author of Across the Pond on February 28th! About the Book: This was going to be a great summer for Dave, Curtis and Victor until their dads decided they needed to get summer jobs. Everyone knows that fifteen is the last chance you get to enjoy your summer before sixteen and jobs comes along! So instead of working, the friends decide they are going to have the sweet life. All they need to do is somehow raise the money they would have gotten by working all summer, and once that's done, they get all summer to hang out. But making $7,000 isn't as easy as it seems. Can they make their money without breaking the law or working too hard and still have time to enjoy the sweet life? GreenBeanTeenQueen Says: This was another gem from the ALSC conference I attended several months ago, so thank you HarperTeen for treating us librarians to such great books! When I first read the summary, I immediately thought of my brother. He's fifteen and this sounded exactly like something he would try and plan. When I finally got around to reading it, I wish I had started it sooner. This book was hilarious and had me turning pages to see what the next Project Sweet Life plan would be. The best part was that none of it ever felt like it was unrealistic-I really believed that the crazy adventures and money schemes could actually work! Author Brent Hartinger has the perfect voice of teen boys. His characters sounded exactly like the teen boys I know. This would make a great pick for reluctant readers but is still a great treat for those who love reading. I can't wait to share this with my teens. Here you go Percy fans! It's the cover of the fifth and final (sniff) Percy Jackson book due out in May. I love this series and have given it to so many tweens and teens since The Lightning Thief first came out. It's one of my favorite go-to books when someone asks what book to read. We'll even be hosting a Camp Halfblood party in late April at my library. I'll be sad to see this series end, but hopefully we'll get to hear more from Percy and Camp Halfblood! Be sure to check out Rick Riordan's blog for a fun interview about the cover! Two picks this week-one a long wait and one a short wait. Enjoy! About the Book (From GoodReads): A dark comedy about a 16 year old boy named Cameron who has mad cow disease and a 16 year dwarf named Gonzo who he met in the hospital. Gonzo is a video gamer who thinks that everything is trying to kill him. Cameron has visitation from a punkish angel named Dulcie who has a propensity for spray-painting her wings. They are all on a mission to get to Disneyworld. GreenBeanTeenQueen Says: Ok, I might get yelled at by a lot of people, but I wasn't in love with A Great and Terrible Beauty. I liked it, but it wasn't my favorite. 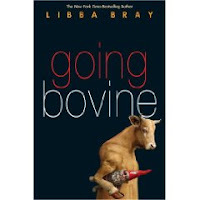 I'm interested in seeing what Libba Bray does with a contemporary setting. About the Book (From Amazon): Marcelo Sandoval hears music no one else can hear--part of the autism-like impairment no doctor has been able to identify--and he's always attended a special school where his differences have been protected. 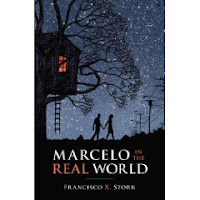 But the summer after his junior year, his father demands that Marcelo work in his law firm's mailroom in order to experience "the real world." There Marcelo meets Jasmine, his beautiful and surprising coworker, and Wendell, the son of another partner in the firm. GreenBeanTeenQueen Says: I've heard some buzz about this one and read some great reviews, so I really can't wait to read this one. Plus, I'm interested in see how Marcelo compares to other austic book characters. -The romance between Anne and Gilbert has always been one of my favorites. As a kid I loved pretending I was Anne. She was firey and spunky, yet GIlbert always loved her. -This was one of the first (more current) YA books I read and I fell in love with Sophie and Robin. I remembered what it felt like to be 15, falling in love, and all the confusion that comes with it. The sequel, What My Girlfriend Doesn't Know, is just as good. -This books are sweet and charming and remind me of Anne of Green Gables and other classics I read as a kid. Willa is my kind of girl-she's smart, she's fun, and she loves to read. Plus, she and the very cute JFK are the perfect couple! -Yes, I know that there are so many other Sarah Dessen books out there, but this one holds a special place in my heart because it was the first one I read. Plus, Owen is totally the type of guy I would have gone for in high school. -This has long been one of my favorite books. Even though there's not much real romance stuff til the end, the journey there is such a treat! -Georgia's antics always leave me laughing. Plus, she has so many guys to choose from, her adventures are so much fun! -This is one of my favorite chick lit, single girl books. Maybe I just loved the fact that the main character has frizzy curly hair like me, but there's something about Jackie and her dating life that resonated with the single girl in the city in me. -As much as I love Mia and Michael, the cast Cabot's Avalon High has to make my list instead. The story of King Arthur is romantic, but set it in a modern day high school and I'm sold! -Yep it's that King Arthur stuff again! Only this one is told from the point of view of Elaine, the lady of Shallot. Beautifully written and full of romance. I sighed while reading this one. Thanks for all the great 2009 YA suggestions. My TBR pile is even longer now!!! Since I can't seem to keep up with my audiobooks, so Audiobook Friday is going to be a monthly feature I think. Also, don't forget that if you want to win a copy of Evermore, leave a comment on my Most Anticipated YA of 2009 post for a chance to win-winner will be announced Valentine's Day! Freefall is part of my I LOVE BOOKS Contest Giveaway! About the Book: What would you do if you were required to serve two years in the military once you’ve turned 18? Aggie’s eighteenth birthday is approaching, and as a teen in Israel, she must serve her time in the Israel Defense Force. Aggie doesn’t want a boring job stuck in an office filing paperwork for two years. So she decides to try for a combat unit. Aggie’s mother is scared and sees her as weak, her friends aren’t quite sure about her decision, and Aggie herself has her doubts about if she can really make it hauling sandbags, sleeping in a tent, and gaining enough weight to be considered. She’s also developing a crush on her best friend’s brother, and life is getting more and more confusing by the minute. When war breaks out and rockets destroy a friend’s house, Aggie decides she needs to be there to help out. But will she be brave enough and strong enough to make it through? 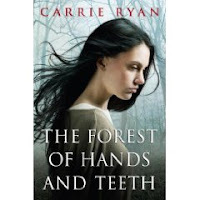 GreenBeanTeenQueen Says: It took me a bit to get into this book, but once I did, I found the story so engaging. The story seems to start right away, without much backstory about teens in Isreal and required military service, so I found myself doing some research online to understand the backstory more. The plot makes it seem like the whole book will be about Aggie in the military, but only a small part takes place with Aggie in her combat unit. The story is more about Aggie growing up and deciding what to do now that she's 18. Even though Aggie is a teen in Israel, her story is one that can resonate with teens everywhere. She has difficulty with her family, she has doubts about her abilities, and she’s unsure about the future. It’s easy to feel as though you’re there with Aggie as she’s struggling with her decisions and you want her to make it. The touch of romance with Noah added sweetness to the story and made Aggie’s tale seem even more real to me. Highly recommended for readers looking for a different take on the familiar coming-of-age tale. About the Book: Remember that myth about Persephone being taken away by Hades and forced to live as his queen underground? Everyone got it all wrong-and Persephone is going to set the story straight. Demeter is a strict controlling mother who makes Persephone stay in the vale. She sees Persephone as a child and would never ever allow a man to visit! So when Hades manages to make his way into the vale, Persephone is intrigued. The two start having secret meetings and begin a forbidden romance. When Hades asks Persephone to join him in the underworld, she can't wait to escape. Little does she know that her seemingly small decision will have a big impact on Earth. GreenBeanTeenQueen Says: The story of Persephone is one of my favorite's in mythology. So when I first heard about this book I knew I had to read it. I was so excited about it, I even did a happy dance in my office when I got it! 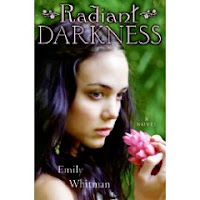 Emily Whitman's retelling does not disappoint! Radiant Darkness has it all-a strict overbearing mom, a rebellious daughter, a forbidden romance, sacrifice and heartbreak. What teen couldn't relate to something on that list? Ms. Whitman does a great job of turning the familiar story on it's head and adding new layers. Persephone is believable and readers will find her relatable, despite her mythical background. I loved that she starts as just a normal girl, who’s even a little klutzy! Her transformation throughout is beautifully written and I was cheering for Persephone along her journey. I also enjoyed reading about Persephone's relationship with a human woman, Melita, who she meets in the underworld. Melita's ideas and influences on Persephone added to Persephone's overall character and made her seem more human. I do wish there would have been a little more with Hades and Persephone and their budding relationship. At times I wasn't sure if I was supposed to like Hades or not, so more interaction from him would have been nice. What was there between the two I did like for the most part though, and Hades grew on me in the end. Overall, this was an enchanting debut and I'm sure readers who enjoy mythology or fairy tales will want to pick this one up. About the Book: (From Amazon): When Katrina spots a homeless guy sleeping in the alley behind her grandmother’s coffee shop, she decides to leave him a cup of coffee, a bag of chocolate-covered coffee beans, and some pastries to tide him over. Little does she know that this random act of kindness is about to turn her life upside down. Because this adorable vagrant, Malcolm, is really a guardian angel on a break between missions. And he won’t leave until he can reward Katrina’s selflessness by fulfilling her deepest desire. Now if only she could decide what that might be . 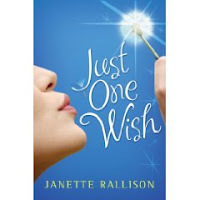 . .
GreenBeanTeenQueen Says: I love romances, and this one has such a great twist, I can't wait to read it! 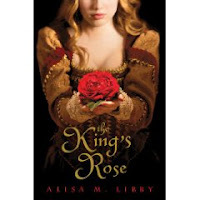 Plus, so many of my teens have raved about Saving Juliet that I'm sure this one will be another hit with my readers. About the Book: (From Amazon:) Cora Bradley dreams of escape. Ever since her reckless older brother, Nate, died in a car crash, Cora has felt suffocated by her small town and high school. She seeks solace in drawing beautiful maps, envisioning herself in exotic locales. When Cora begins to fall for Damian, the handsome, brooding boy who was in the car with Nate the night he died, she uncovers her brother's secret artistic life and realizes she had more in common with him than she ever imagined. This is the tale of one girl's journey through the redemptive powers of art, friendship, and love. GreenBeanTeenQueen Says: I'm a big fan of Ms. Sandell, so I can't wait for this one to release! I fell in love with her writing in Song of the Sparrow, and even though this one isn't writin in verse, I'm sure her beautiful writing style will be there! About the Book: Well, I couldn't find much about the book, except this short blurb from the author's website: "You know, I always thought I told you everything, but there are some things I should have said but never did. I should have told you about the time I lost your new sunglasses. I know you really liked them. I should have apologized the time I ruined your brand-new skirt, the one with the beading. I should have apologized for a lot of stuff. I’m sorry. I’m sorry for everything." GreenBeanTeenQueen Says: An amazing cover and it's by Elizabeth Scott! What else do I need to say?? Plus, it comes out the day after birthday, so it's like a beautiful birthday present to me! 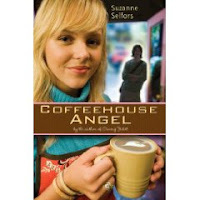 GreenBeanTeenQueen Says: First off, I love the format of this book. It's told through Ryan's journal entries mixed in with videos from Sarah, which readers can access online with the passwords given in the book. The mystery itself is plenty scary and will give readers a good fright. I've been booktalking this to my middle schoolers and they get so excited when I say they get to watch videos along with reading. I have a group of students that are eager to get their hands on this one, so I'm sure it will be a hit with younger readers. 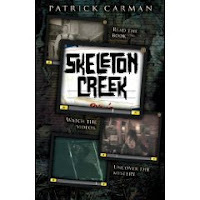 This is a great pick for tweens, but older readers who enjoy scary stories will enjoy it too. As many of you know, I work as a teen librarian. One thing I'm working on now is coming up with a list of the most anticipated YA books for 2009 so that my library can hopefully pre-order them. I love looking for new books and have a big long list to pass on, but I'm interested in knowing what you're looking forward to reading this year. Anything I should add to my 2009 wish list? About the Series: Risa is the tallest girl in class and Otani is the shortest guy. Everyone thinks it's hilarious to pair them up together, but they hate it. When they need each other's help to hopefully win over some crushes, they decide to forget the fighting and work together. This starts an unlikely friendship between the mismatched duo. Everyone around them thinks Risa and Otani are a perfect pair, but when will they finally see that? 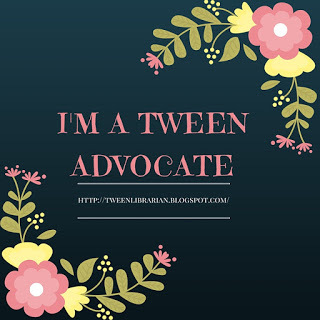 GreenBeanTeenQueen Says: When I started working with teens a little over a year ago, one of the first things I knew I had to do was start reading manga. Since I'm usually drawn to romance and fun, I of course ended up picking up romancey and fun manga! This series continually cracks me up and I love the friendship (and hopefully relationship) of Risa and Otani. Every volume I've read adds more to the story and I've never thought the story got stale. 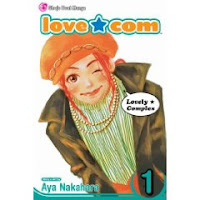 Even if you're not a fan of manga, this is one series worth checking out. Also, if you get a chance, Netflix the live action movie. It does a great job bringing the manga to life! About the Book: Trinity is a dream walker. She can see into people's dreams and knows their secrets. She even helped find Rafe Stevens, who murdered Trinity's friend Kiri. But now the murder trial is over and Rafe's got everyone convinced he's unstable, so he gets locked up in a mental hospital. It's there Rafe learns to dream walk too and this time he's after Trinity. She needs to stay awake to stay alive. I ended up loving it! It was a quick read that kept me up-(in a good way wanting to read more, not in an 'I'm so scared' kind of way) and it was full of suspense! Plus, there's a great romance between Trinity and Dan, who just so happens to be the son of the lawyer that got Rafe off on insanity. It was just a perfect blend for a scaredy cat like me. There's a lot about Trinity's dream walking gift that I'd like to know, so I hope Terri Clark writes more about Trinity. Plus, Terri Clark is a teen librarian-yay-and who better to write for teens than someone who works with them all day? (I especially loved that she had Dan and Trinity head to the library to do research!) I thought this was a good debut and I'd recommend it readers wanting some mystery and suspense with their romance. Since January ended up fizzling out and I didn't get to do my grand prize contest, I'm moving it into February and making it even bigger and better! February is the month of love, and I love books, especially books about love. So I'm celebrating with an I love books contest. Contest Details: Contest runs Feb. 5th-Feb. 28. Winner will be picked March 1st. What's Included: A prize pack of books, which I'll be adding to throughout the month and a $20 gift card to Amazon.com! How to Enter: There's lots of ways to enter! I'm picking one book for this week's Want It Wednesday, because I really really want to read it! Catching Fire by Suzanne Collins is the second book in the Hunger Games Trilogy and it comes out September 8, 2009. I can not wait until September!!! I'm especially excited because I've gotten my co-workers and even my fiance addicted and it's so much fun to talk about with them. I won't post any summaries, because I don't wait to spoil anything for those who haven't read Hunger Games. If you haven't read it, you need to get out and read it! About the Book: Eleanor “Groovy” Robinson dreams of going to cooking school. She plans menus and tries recipes and hopes to be like Betty Crocker. But the year Groovy turns eleven is the year everything changes. Her daddy is suddenly taken away to jail, her best friend’s long-lost mother makes a return, and the trusty faithful swallows that migrate through her town appear early. Growing up is hard and families can be difficult - and Groovy is learning to expect the unexpected. GreenBeanTeenQueen Says: Way back in September, I attended a conference given by the children's division of ALA. HarperCollins was nice enough to pass out a handful of Arc's to all us book hungry librarians and The Year the Swallows Came Early was one of them. I stuffed the books in my new "I Can Read" bag (also from the conference-gotta love free stuff!) and carried them home on the plane, only to not really look at the books for awhile. A couple of weeks ago I picked this one up to review for TeensReadToo.com and fell in love. Reading The Year The Swallows Came Early was such a delightful treat! The chapters were short and moved quickly and was such an engaging read. Groovy is a strong and lovable character whose growth throughout the story felt real. I felt like I was learning and growing along with Groovy as things were uncovered around her. Author Kathryn Fitzmaurice’s writing is like poetry and her story pulled me in. Even though there was a lot packed into the story, the pacing was perfect and each chapter added a wonderful new layer to Groovy’s story. Even though it's a tween book, I would recommend this one to all readers. I love when I'm surprised by a book and Kathryn Fitzmaurice is definitely an author to watch! 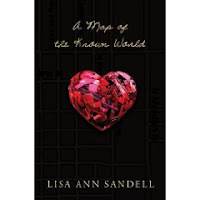 This is a wonderful pick for readers looking for something unexpected.